The empowerment of women does not mean the exclusion of men. It means to contribute to the emancipation of all people — men and women. It was with this idea in mind that the Latin American Waste Pickers’ Network (Red Lacre), the National Movement of Waste Pickers in Brazil (MNCR), and Women in Informal Employment: Globalizing and Organizing (WIEGO) began discussing in 2012 the importance of opening up a dialogue about gender in the context of waste picking, or informal recycling. Taking advantage of an existing relationship with the Center for Study and Research on Women (NEPEM) of the Federal University of Minas Gerais (UFMG), members of the previously mentioned groups decided to start a pilot project in Minas Gerais that would explore themes for a future program about gender for Brazil and Latin America. The development of the gender project in 2012 was participatory. Over the course of that year, several meetings were held with women waste pickers from various cooperatives throughout the state of Minas Gerais. Participants decided that exploratory workshops throughout the state should be held. In 2013, as a result of this participatory process, the gender project was born as a partnership between MNCR/ANCAT, WIEGO, NEPEM, and INSEA. Exploratory in character, the project aims to involve women waste pickers in discussions about the multiple forms of discrimination that women face at home, at work, and in their political leadership roles. In addition, the project aims to map strategic and practical needs for training and professional and educational qualification, which women waste pickers need in order to become economically and politically empowered. And so the workshops have started! 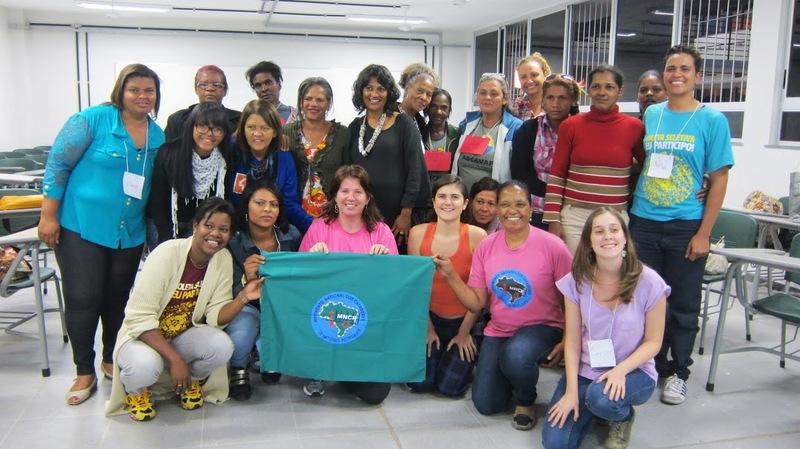 The first workshop kicked off on May 13 with the participation of 17 enthusiastic women waste pickers from the metropolitan region of Belo Horizonte. The day-long event was organized by NEPEM, and the space provided by UFMG. The participants began the day with a poetic presentation by waste picker Tia Cléia and explored, through interactive activities, themes like autonomy, masculinities and femininities, obstacles to their empowerment, as well as confrontation techniques. The energy and quality of these discussions, coupled with the commitment and passion of the women participants in the struggle towards a just society and better conditions for waste pickers, set the tone of the workshop. Talking about gender shouldn’t be seen as a problem but rather, as a solution . This concept became clear during the workshop. To include gender discussions within representative organizations is crucial in the improvement of their internal democratic structures. It also contributes to creating more equal relations between men and women. That is, discussing gender is completely in line with the social struggle of waste pickers — a struggle which brought waste pickers out of their invisibility. Congratulations to women waste pickers, congratulations to the MNCR for supporting this struggle. Congratulations to all who have supported this project. Foto de grupo com os participantes do projeto sobre gênero em Minas Gerais/ Group photo with participants of the gender project workshop in Minas Gerais. Dinâmica da árvore: discussões sobre autonomia / An activity called the Tree Dynamic involved discussions about autonomy. Entrega da certificação dos participantes da oficina/ Participants receive their certifications after the workshop. Catadoras participando da Dinâmica da Rede. Waste pickers participating in the Network Dynamic (activity).